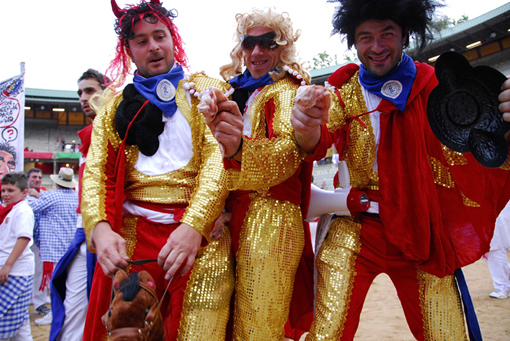 A Peña is a group of people or friends sharing a common enthusiasm for the San Fermin fiestas, set up as a society in order to take part in the organisation and enjoyment of the events held during the fiestas. The Peñas are an essential part of the bull fighting and the music from their bands enlivens the street atmosphere, providing non-stop entertainment throughout the fiestas. The majority of the Peñas are located in premises in the Jarauta street and surrounding area, offering a very special San Fermin atmosphere of nine days of non-stop fun. During their impromptu parades through the Old Part of Pamplona, the Peñas carry banners depicting episodes of the city life. The first Peñas were founded in the mid 19th century, when groups of friends used to get together to go to the bullring and enjoy the fiestas. At that time Pamplona was but what is now known as the Old Part, a city with very few leisure options. Those first Peñas, with names such as El Trueno, La Ochena, La Cuatrena and El Llavín, paraded through the streets carrying simple banners with cartoons and greetings to the few foreigners present at the fiestas. A few players of the Dulzaina (Spanish double reed instrument), Txistu (Spanish flute) and guitar were the inspiration behind the tradition of the present-day bands, filling the streets with music, offering special, cheerful, catchy tunes. Music which started to be played from the thirties onwards, written by the composer Manuel Turrillas, specifically created for the San Fermin fiestas. From 1950 - 1970, relations between the various Peñas were fluid and co-operative when preparing the San Fermin events. This spirit of goodwill was also extended to the collaboration of the Peñas with the City Council and other official bodies. The "formal" establishment of the Peñas Commission in 1959 was a milestone event, allowing the Peñas to act together when presenting their concerns over the Dianas (early morning reveilles), bull running, attendance at the San Fermin procession, payment of the bands of musicians, subsidies, festivals of the Peñas, post bull-fight parades, season tickets for the bullfight, etc. From 1964 - 1979, the Jito-Alai open air dances were organised by the Irrintzi, Alegría and La Jarana Peñas, an initiative suggested by the City Council. There have also been occasions on which the work of the Peñas has been recognised, such as the silver medal granted by the Ministry of Information & Tourism to the Peñas of Pamplona for services to tourism. During that same year, the warm reception given to the film artists and foreign reporters from the International Film Festival of San Sebastian, when visiting the San Fermin fiestas, was rewarded with the Silver Shell at the festival. Currently there are a total of 16 Peñas, which were founded at different dates during the 20th century. The first was La Única, established in 1903, followed by Muthiko Alaiak in 1931, El Bullicio Pamplonés (1932), La Jarana (1940), Oberena (1941), Aldapa (1947), Anaitasuna (1949), Los del Bronce (1950), Irrintzi (1951), Alegría de Iruña (1953), Armonía Txantreana (1956), Donibane (1977), La Rotxa (1978), 7 de julio San Fermín (1979) and San Jorge (1980). During the San Fermin fiestas, the Peñas are the undisputed protagonists of the seats in the sun in the afternoons at the bullring. These were the cheapest seats, affordable by their working class members. The heat combined with the desire for revelry, was and still is an open invitation to spend the afternoon drinking and eating, enlivening the atmosphere far beyond what is actually happening in the bullring. Yet more Peñas were founded in the seventies, getting the high cheap seats on the sunny side of the ring (Andanada), which means that the Peñas as a whole now occupy the majority of the seats in the sun. The Peñas are present throughout each day of the festivities. Half-way through the morning, the Peñas go out onto the streets, with their banners, in an impromptu parade through the Quarters, accompanied by the music of their bands, stopping for a drink from time to time and offering the neighbourhood an improvised open-air concert. Each Peña has two banners, one for adults the other for children, and which are carried round by its members throughout the fiestas. Full of humour, these banners feature cartoons and caricatures of key events occurring over the past year. The subtly imposed by the period of political censor has long been abandoned subtly when creating these banners, which now clearly depict views on topics and persons from anywhere in the world, although local topics are the key source of inspiration. Each particular Peña is also distinguished by its attire - each society has its own coloured smock with the coat of arms of the Peña. Members also wear a kerchief of a particular colour, but not red. The afternoon starts with the preparations for the bullfight, which can take some time as they have to prepare the drinks which are carried to the ring in buckets, pans of Aojarriero (cod in tomato and garlic sauce) and other devices for the revelries at the ring. Followed by their inseparable bands, the Peñas join the procession of mules in a festive atmosphere as they head towards the ring. After the bullfighting the Peñas parade through the passageway leading out of the ring, carrying their banners, and followed by their bands. This traditional ritual is called the "Salida de las Peñas" (exit of the Peñas). From there, each Peña heads in the direction of its headquarters. The Peña members meet up at their premises for supper and to start a night of revelry. The streets of Jarauta and Navarrería, where the majority of the Peñas' headquarters are located, are filled with this special atmosphere, enlivened by the music of their bands and San Fermin gaiety. Although the Peñas were created for and as a result of the fiestas of San Fermin, their members meet up and organise a number of culinary, cultural and sporting events throughout the year. The celebration of the San Fermin "ladder" is well known, whereby they celebrate with an evening meal on each of the days mentioned in the song: first of January, second of February, third of March, fourth of April, fifth of May, sixth of June, seventh of July... ¡San Fermin!.